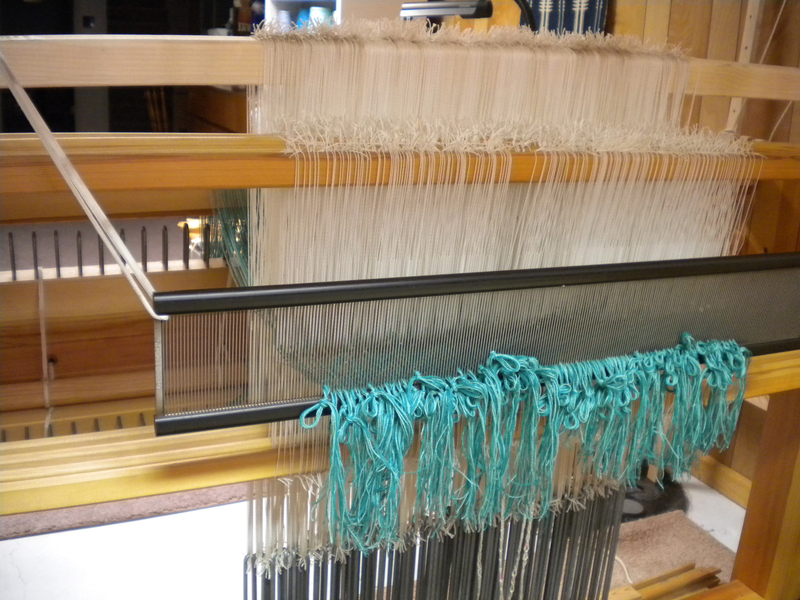 When I bought my Glimakra countermarche, I included a drawloom attachment with 20 pattern shafts. These shafts are separate from those that weave the ground cloth. I had worked on one of these looms at the Weavers School in the early ’90’s and fell in love with the intricate design possibilities. Alas, the class looms were set up beforehand and we didn’t go into how to get from frame to warp. Over the years, I read whatever I could find on drawlooms and their set-up, but my learning style is hands-on and I confess that I often have to read something many times before I can visualize it. It’s only in the execution that things start to click. And sometimes my understanding (or lack thereof) is reflected in the results. Mostly I learned by trial and error. A lot of error. Gracious, experienced weaving friends held my hand, patiently suggested I needed more weight here or there, and explained that yes, that tie-up is right, just try it. To these I owe so much! Recently I was going through my old weaving records and found that I had successfully woven opphämta many years ago, just not very much of it. This is a lovely pattern weave on a plain weave or basketweave background. That’s on my to-weave list for this year. 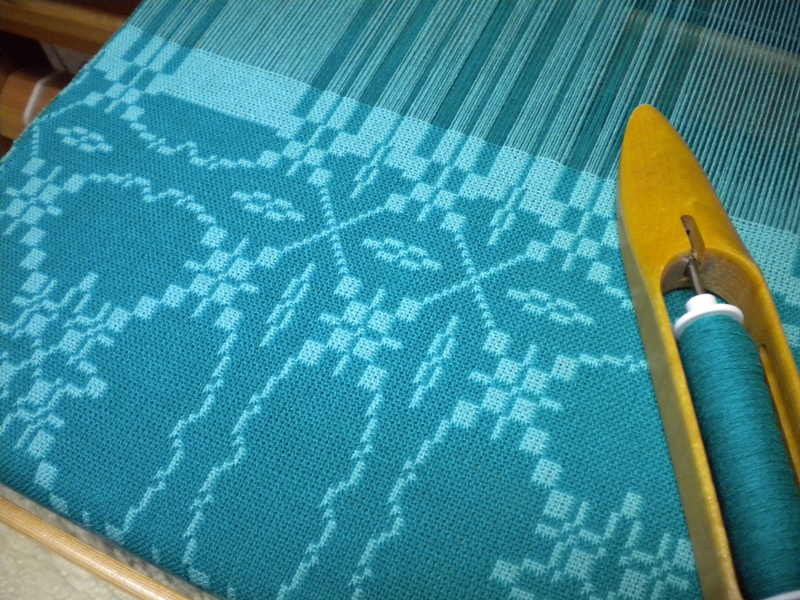 And I had looked into figured doubleweave previously too, even though I couldn’t find samples from the drawloom. The structure I’ve had the most success with has been 5-shaft satin damask. Not all my pieces have been satisfactory, but with each one, I learn more. I look forward to weaving more damask soon. All this is background to what has been a learning curve over the past couple weeks. Using “Dress Your Swedish Drawloom” video with Becky Ashenden of Väv Stuga Weaving School, I set about threading figured doubleweave on my drawloom. This is a great video with a lot of step by step instruction. I watched it several times, referring back to specific steps. In particular, I noted how she teaches threading the loom while sitting inside the frame. The video clearly explained the positions of each part of threading this way. I’ve read about this before, but never tried it. I should have long ago! It is so much easier on the body—much less stretching and reaching. And I only dropped all my heddles once, watching in dismay as they slid off the bar in slow motion like a bad movie. O my! But back on the bar they went. I also had difficulty transferring the pattern heddles to the individual lower pattern shaft bars, probably because I didn’t have enough weight on them, which resulted in having to do some rethreading. The warp threaded through pattern and ground heddles, then through the reed. 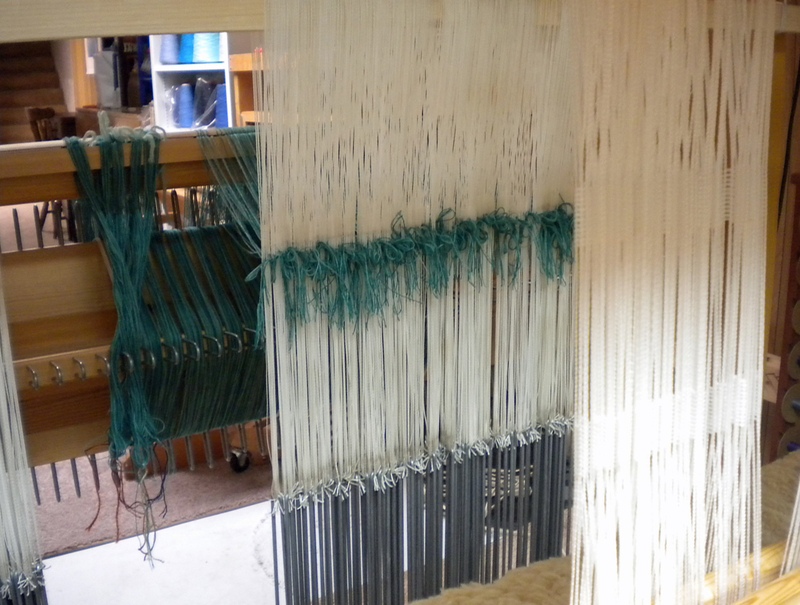 It took a couple extra days inside the loom, but the warp is on and the weaving is progressing. I will have to adjust the pattern so that the motif is more of a circle than an oval, but overall, it’s exciting to see the pattern take shape (see above). I’m working with two shades of jade with this warp, but plan on do some more with other hues. After all this work to get it threaded, I want to weave more than just one warp on it! Then after the doubleweave, it’s on to opphämta and some more damask. Weaving is a learning adventure! Well, I pretty much have no idea what all this means but the outcome looks spectacular! There’s so much to learn in weaving! That looks fascinating . . . hard but fascinating! Jean, I’ve never woven on a draw loom. As I understand it makes certain weaving structures easier to accomplish due to the shed produced. Your piece looks amazing.